Tweet for Free Train Ticket! Are you a ‘starving startup’? A simple tweet can get you a lot these days…. 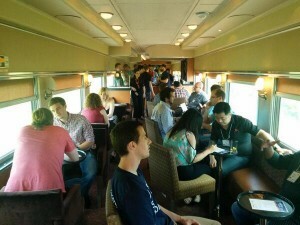 We have two full tickets on this year’s Ontario Startup Train to give out to two starving startups. These tickets include our first class train from Toronto to Montreal along with full access to the International Startup Festival. These tickets are intended for startups that really cannot afford to buy their own tickets. Our train always sells out so if you can afford a ticket then you should just buy your own asap to ensure you get a spot. Entering into this contest is simple. Follow our Startup Train account on twitter, then post to twitter why you should be on the train with us, making sure you mention @StartupTrain in your post. Some examples…. [EDIT] The date below should have said July 3rd! We’re running this for one week, so it closes 5pm on July 2nd. If you’re curious why people have taken the train previous years, check out their videos!